Subject: Pictorial Illustration of Game-play: A sample turn as a weakened King Henry VI fights desperately to save London! To help illustrate how Richard III works, especially for gamers not familiar with block war games, I figured I'd provide other folks on BGG a pictorial illustration of the game-play, with the intent of showing how the game works and giving a sense of the flow of play. So welcome to a sample turn of Richard III! 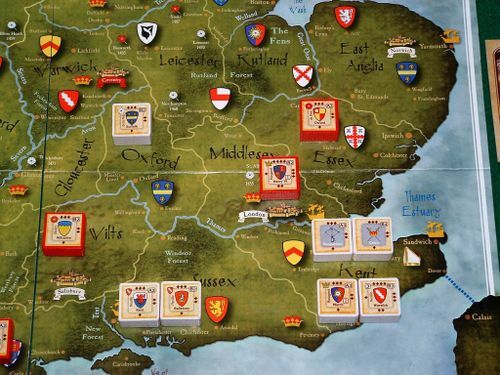 This is early in the game, and the house of York (white blocks) is taking on the house of Lancaster (red blocks) in an attempt to win the crown! 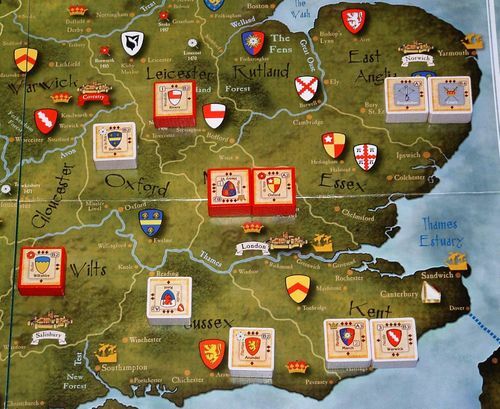 The situation is such that Lancaster's Henry VI is king in London, but his position is vulnerable as a result of the advancing Yorkish armies along with their mercenaries. What will happen next? Read on to find out! NB: Normally blocks are standing upright and hidden from the opponent, but to illustrate gameplay in this example, they are all face up with the same orientation. Both player simultaneously select and reveal a card from their hand. York plays a 3 and Lancaster plays a 2. York has the higher number (3 Action Points), and thus gets to play first. 1. 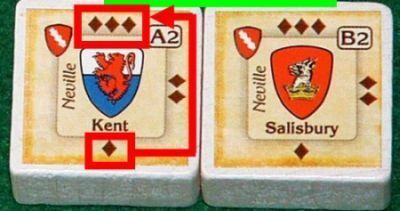 Sea move: using a Sea Move, York moves the Burgundian and Calais mercenaries from Kent to East Anglia. Since it is from one Major port to another (Sandwich to Yarmouth) in the same Sea Zone, moving two blocks only costs 1AP. 2. 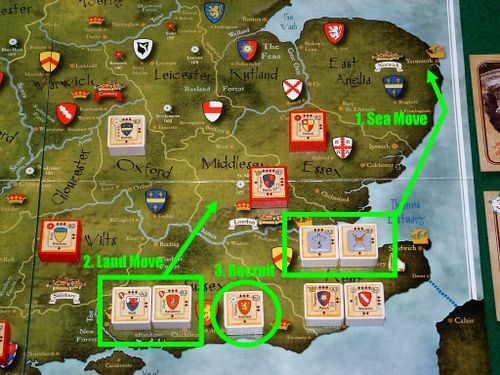 Land move: Using another 1AP, York sends the Earl of Kent and the Earl of Salisbury across the Thames River to attack King Henry VI in Middlesex. The king is now pinned, and will have to face at least one round of battle! 3. Recruiting: York recruits the Earl of Arundel in Sussex for 1AP. Note the matching shield, which represents the Earl's own castle. Note that York is not obliged to use its Action Points in a particular way, and could equally have used all APs for Sea Movement, or Land Movement, or Recruiting, or any combination of the above. 1. Recruiting: Lancaster uses 1AP to recruit Lord Rivers in Leicester, to provide some back up support. Unfortunately for Lancaster, as a newly deployed recruit, Lord Rivers can't move to Middlesex to help the King this turn! 2. 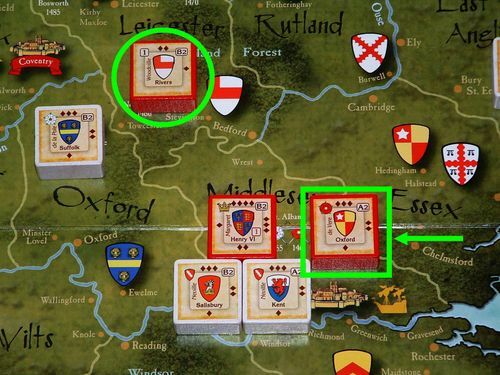 Land move: Henry VI needs some help, so Lancaster sends in the Earl of Oxford from Essex to Middlesex, as Lancastrian reserves for the inevitable battle there. Here's the scene of the battle in Middlesex! In this example, all blocks happen to be at full strength at the start of the battle. The Earl of Oxford is a reserve, and will only enter the battle in the second round. NB: in the pictures of battle that follow, I will place the Lancastrian blocks upside down (i.e. south is top, north is bottom), as they would be in a real game. Initiative is resolved, and first all the A blocks get a chance to fire, then the B blocks. When blocks have the same initiative (e.g. A), then the Defending player gets to fire before the Attacker. * Earl of Kent (York): There is only one A block, the Earl of Kent, rated A2. His strength is 3, so he rolls three dice, and the A2 means he scores a hit on every 2 or less. York rolls, but the numbers are all high, so there are no hits! * Henry VI (Lancaster): Both the Earl of Salisbury (York) and Henry VI (Lancaster) are B blocks, but since York is the Attacker in this battle, Lancaster as the Defender gets to roll first. It's the first round of battle, so Henry VI may not retreat and has to fight. Henry has a strength of four, so he rolls four dice, so the odds are in his favour! But his rating of B2 means he only has a firepower of 2, i.e. only a 2 or less will score a hit. In this case he is defending a crown, so his rating goes from B2 to B3, and he also scores hits on 3s. 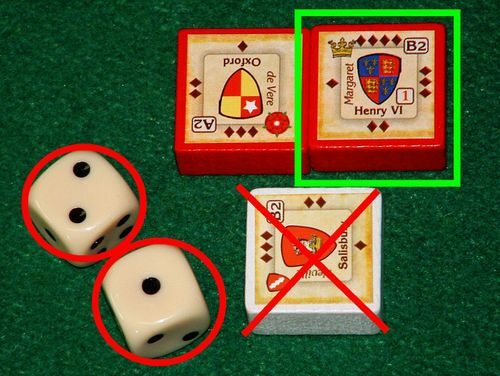 (Note that as the King, Henry VI does have the special privilege of choosing to perform a treachery roll or an heir charge at this point, but we'll keep this example simple). He rolls the dice and wow, a one and a two, which means two hits! 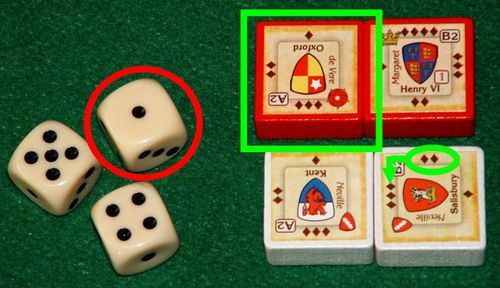 Normally the hits are all applied to the strongest block, but since both of York's blocks have a strength of three, the York player can choose which block the damage is applied to. 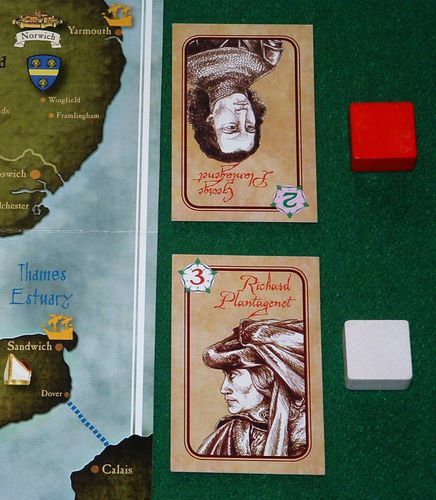 He's about to fire with the Earl of Salisbury, so he decides to let the Earl of Kent take the damage and go down to a strength of 1 - this block is rotated accordingly. 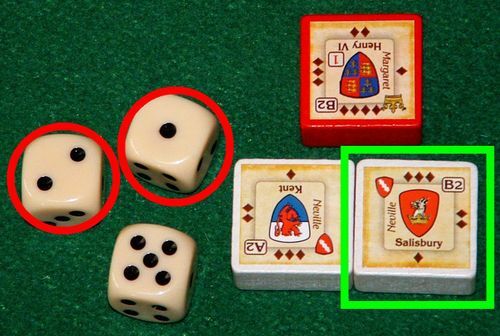 * Earl of Salisbury (York): With a strength of three, the Earl of Salisbury shoots by rolling three dice. It's also rated a B2 so it also will only hit on a two or less. A 1, 2 and a 5 - that means that the Lancastrian King takes two hits and will go down two steps! But that ends the first round of combat, and now the reserves (i.e. Earl of Oxford) enter the battle. Now things are starting to look better for Lancaster! * Earl of Oxford (Lancaster): As Defender, Lancaster has the privilege of firing first. 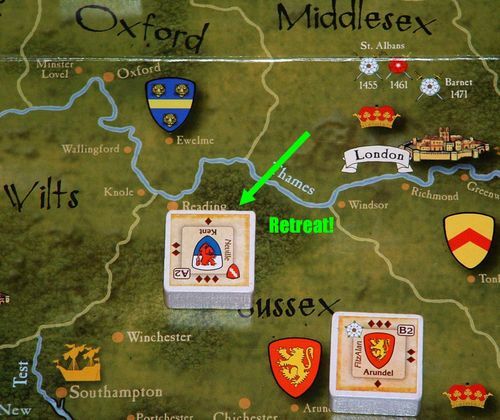 He could retreat the Earl of Oxford at this point, but since he has the advantage of firing first, and York's Earl of Kent has already been weakened, Lancaster decides to keep up a stubborn resistance. 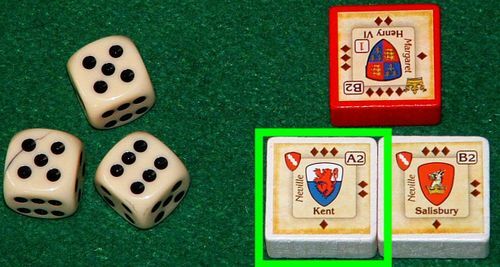 The Earl of Oxford rolls three dice - a 1, 4 and 5 - that's another hit! 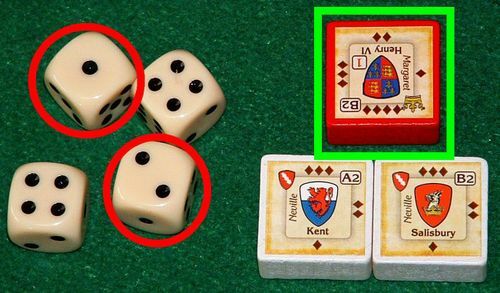 Of the two York blocks, the Earl of Salisbury is the strongest (3 vs 1), so the hit is applied to it, and it loses a step to go from a 3 in strength to a 2. * Earl of Kent (York): Lancaster is doing well - should York keep fighting? 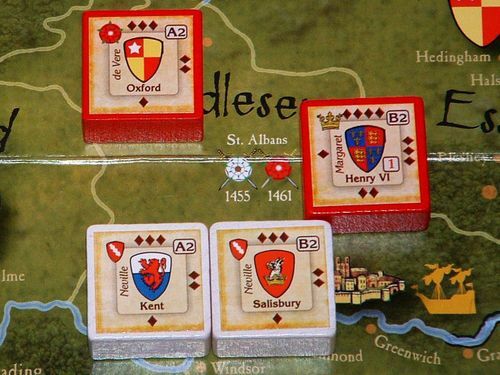 Its blocks are already weakened, and it has the disadvantage of firing second, so York decides to lick its wounds and retreat the Earl of Kent back to Sussex. * Henry VI (Lancaster): Lancaster is on a roll - this is no time to retreat! As Defender, Henry gets to fire ahead of York's B2 block, and rolls a 1 and a 2! That's two hits, which finishes off the Earl of Salisbury - it's eliminated and permanently removed from the game. As it turned out, it was a foolhardy attack from York, and by underestimating Lancaster's defensive advantages, York's attack failed miserably. Lancaster's king suffered some wounds, but with the help of the Earl of Oxford, inflicted far more damage on York, and retains control of London. But York has learned a lesson: next time attack with a larger force! 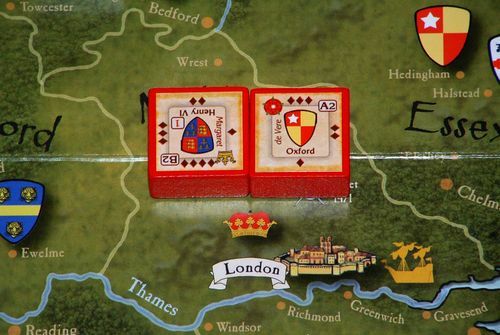 In many actual games, York will launch an assault on London with superior numbers, and trying to hold on to London will often not be a viable strategy for Lancaster. But in this case, it worked! Each area can supply food for only four blocks (five for an area with a city) - no areas have more than four blocks, so no blocks above the allowable limit need to be reduced a step. Here's the scene after the supply phase. Let's learn how to play an introductory block war game with a pictorial review of Hammer of the Scots' brand new cousin! Excellent report. As a new gamer who is interested in this game because of the theme, but is totally inexperienced in block war games, I can appreciate this report a great deal. The great pictures help a lot in figuring out some part of the game play. Excellent session report as usual Ender. I've been following your pictorial reviews and they are truly marvellous. I feel I'm sitting on the same table learning to play this game. Hope to see your pic review for this game soon since I'm deciding my Christmas gift between this game and HoTS. this is a fantastic way to introduce a game. Thank you. That most probably has convinced me to go buy this game.